Also when you find that file if you do let me know where it is located. I cudnt find the file. Also,kindly answer my previous queries. On scanning today,avast showed 4 files are still infected with trojan horses (same old location C:\System information).Is it safe to use by Becker Software as my exams are nearing?. On scanning today,avast showed 4 files are still infected with trojan horses (same old location C:\System information). This is your system restore point this will show infection until we reset your retore point at the end. Please do not run system restore unless instructed to, doing that at this point will set us back a long ways. Is there any other way to retrieve files on deleting from Recycle Bin? No there is no way to retrieve files when they have been deleted from the recycling bin. Once you delete them from there they are gone. Ok let's use OTMoveIt 2 to move those files to a folder and then zip the folder and then upload them to uploadmalware. Please go to UploadMalware to upload a suspicious file for analysis. Please post back with Combofix.txt, c:\_OTMoveIt\MovedFiles\mmddyyyy_hhmmss.log, results of uploadmalware files. LXCGCATS = rundll32 C:\WINDOWS\System32\spool\DRIVERS\W32X86\3\LXCGtime.dll,[email protected]??????????????????????????????????????????????????????????????????????????????????????????????????????????????????????????????????????????????????????????????????????????????????? O4 - HKLM\..\Run: [EzPrint] "C:\Program Files\Lexmark 2300 Series\ezprint.exe"
Thanx for answering my queries.I had submitted both files of OTMoveit, one created on 21st March and other created today. Thanx for answering my queries. Please post back with Combofix.txt, and kaspersky results. 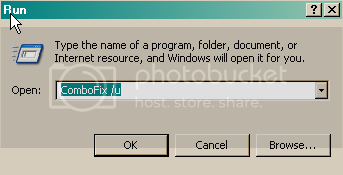 When i tried to run Combofix,a message appeared saying that some of the files of installation are currupt.Please download a fresh copy.what shd i do?....download from bleeping computer's site???? Edited by anpsi, 04 April 2008 - 01:44 PM. Please delete the combofix you have now and any logs you have, then follow the instructions I gave you in the last post. "2008-04-05 22:58:43 C:\WINDOWS\Tasks\MP Scheduled Scan.job"
First, let's reset your hidden/system files and folders. System files are hidden for a reason and we don't want to have them openly available and susceptible to accidental deletion. * Click Start. * Under the Hidden files and folders heading UNSELECT Show hidden files and folders. * CHECK the Hide protected operating system files (recommended) option. Reset and Re-enable your System Restore to remove infected files that have been backed up by Windows. The files in System Restore are protected to prevent any programs from changing those files. This is the only way to clean these files: (You will lose all previous restore points which are likely to be infected)1. Turn off System Restore.On the Desktop, right-click My Computer. 3. Turn ON System Restore.On the Desktop, right-click My Computer. [/list]System Restore will now be active again. Download the latest version of Java Runtime Environment (JRE) 6 Update 5 and save it to your desktop. Scroll down to where it says "JJava Runtime Environment (JRE) 6 Update 5...allows end-users to run Java applications". Read the License Agreement and then check the box that says: "Accept License Agreement". The page will refresh. Click on the link to download Windows Offline Installation and save the file to your desktop. Go to Start > Settings > Control Panel, double-click on Add/Remove Programs and remove all older versions of Java. Check (highlight) any item with Java Runtime Environment (JRE or J2SE) in the name. Then from your desktop double-click on jre-6u5-windows-i586-p.exe to install the newest version. SpywareBlaster to help prevent spyware from installing in the first place. SpywareGuard to catch and block spyware before it can execute. IESpy-Ad to block access to malicious websites so you cannot be redirected to them from an infected site or email. weekly, and be aware of what emails you open and websites you visit. To learn more about how to protect yourself while on the internet read this article by Tony Klein: So how did I get infected in the first place?